A handmade blanket can make a very special gift for a baby or child. A unique blanket can be a great way of showing new parents you care. Having something homemade to snuggle up to can be very comforting for youngsters, especially if they have to be away from home. You'll need one to two yards of soft, warm fabric. For a small baby, blankets need only be a yard to a yard and a half long and two feet across. For an older child, use at least two square yards. If you want to make a fringed blanket, allow an extra three to six inches of fabric all the way around. Good fabrics to use for blankets include flannel, quilting fabric, faux fur and especially polar fleece. You can use two kinds of fabric for a double-sided blanket. 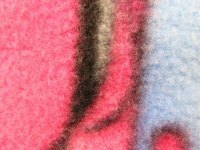 For example, you can sew a yard and a half of faux-fur back to back with two yards of polar fleece, allowing the polar fleece to be snipped into a fringe. Be careful with baby blankets. Do not put a baby to sleep in a crib with a blanket until she is at least 12 months old to reduce the risk of crib death. BabyCenter: When Can My Baby Sleep With A Blanket?